All-in-one cart stores everything you need to perform job tasks. Wont dent, rust, or chip and will not conduct electricity. Each shelf is surrounded by a retaining lip that keeps items from rolling off. 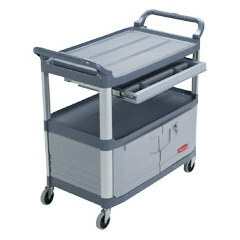 Other features include: dual molded-in handles; pull-out utility tray, and 34"W x 20"D x 11-3/4"H locking cabinet. Color: gray. IN STOCK.